Please tell us a bit about Star Rapid, who you are and what you do? 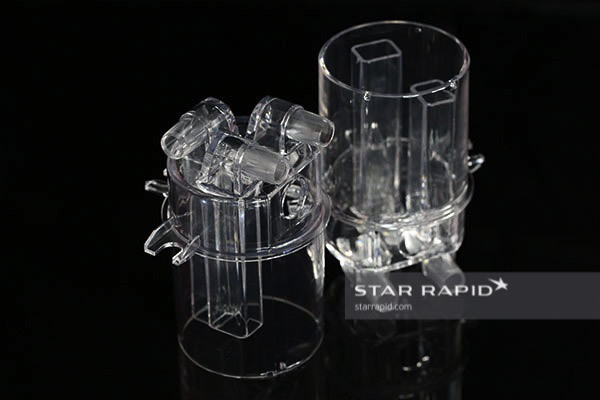 Star Rapid is a global rapid prototyping, rapid tooling and mid-to low-volume manufacturing company founded in 2005. With an international team of engineers and managers, the company combines advanced manufacturing technologies like 3D printing with traditional manufacturing techniques like plastic injection molding and CNC machining to provide customers with a multitude of services to meet their manufacturing needs. Star Rapid has facilities located in Zhongshan, Guangdong Province, China and sales offices in the United States, United Kingdom, Australia and Germany. What was unique about the Marco Beverage Systems Coffee Reservoir? Marco Beverage Systems is a premium designer and manufacturer of specialty water boilers, filters, coffee makers and coffee grinders. The company needed our expertise to create a transparent, high-quality reservoir cup to supply hot water to the coffee making system with its SP9, a single serve precision brewer with one or two heads used as part of the counter unit. The coffee reservoir for the SP9 is an integral part of the aesthetic of the product as it elevates the experience of pour-over brewed coffee in high-exposure and fashionable locations, and makes the system appealing to its niche customers. What manufacturing processes did Star Rapid used to create the system? Producing the reservoir cup for the SP9 required Star to create mold tools using CNC milling, CNC turning and EDM/wire EDM machining. Once the mold tools were created, plastic injection molding was used to make the reservoir. What design and engineering specifications did Star Rapid have to meet to create the system? The design specifications called for a clear plastic reservoir that would be food-safe, immune to boiling water temperatures without degrading, and would maintain a transparent finish over time. Therefore, we needed to specify a plastic compound that could meet these needs, while still being moldable. Originally, Marco Beverage Systems wanted to use Solvay Veradel A-301, however, after testing with the finished mold, our engineers noticed that Solvay tends to degrade if it is heated for too long. This presented a problem during the plastic injection molding process. Since the project required a long injection cycle, Solvay became too brittle in the thin-walled sections of the mold, making it unsuitable. So, we recommended the use of Eastman Tritan TX2001 Copolyester for the component, which proved to be stronger, more flexible and tolerant of the long heat cycle. The engineering specification required careful attention to wall thicknesses and draft angles, to accommodate a complex tool design. Were there any challenges faced during this project? How were advanced manufacturing technologies used to overcome these challenges? Advanced manufacturing technologies were an integral part of the development of the reservoir. As with all of our projects, a design review is first conducted. Looking at the design of the component it was a complex part with intricate challenges for the toolmaker. Using CNC milling, CNC turning and EDM/wire EDM machining, the toolmaker created tools to make the component using plastic injection molding. The main body of the reservoir is essentially a hollow cup, so making a core and cavity to mold was straightforward. However, the challenge was making the molding inserts for the long, rectangular projections housed inside the cup. The inserts were first machined from solid bars of NAK80 tool steel, with external dimensions to exactly fit the size of the plastic columns that they would be molding. Then, a single long hole was drilled down the center of the insert starting from the base, keeping as close as possible to the tool walls and the end of the tool, without actually drilling through it. In fact, two different hole geometries were tried, to test which had the best cooling effect. One was a circular hole, the other with a square cross-section, matching the external shape of the insert. This later was made using sink EDM. This hole needed to accommodate the passage of coolant, going into and out of the tool. But since it was conventionally manufactured and not 3D printed, the hole itself was a single channel, not able to perform a 180° turn at the tip and therefore unable to return coolant in a continuous loop. To counter this, after the hole was drilled, a long thin baffle was then inserted into the hole, bisecting it. This baffle was designed to nearly reach the tip of the inside hole but not quite sealing it off at the end. This would then force any liquid coolant to run the length of the channel down one side of the baffle, take a turn at the end, and then be forced back through the return channel. This would then approximately replicate the same effect as 3D printing a single, 180° channel. Maintaining a precise wall thickness the length of this cooling channel was critical for achieving the needed effect on the finished part. In addition to the above, the complex arrangement of inserts and sliders needed to be choreographed with a precise sequence and timing to balance out thermal and mechanical stresses for each injection cycle. The use of manual inserts and sliders provided physical support to certain features of the part while it was being molded. Those sliders, in turn, needed to move out of the way – without damaging the part – to allow for part removal. For the tool, the cavity and core needed to separate without sticking too much in the mold. Therefore, we had to create a draft angle of 5 degrees, enough to free the tool and still meet the functional and aesthetic requirements. There were three projecting inlet fittings at right angles to the opening direction of the mold tool. These features were thin-walled sections that needed to be released separately from the main cavity/core. Hydraulic sliding cores helped with this. The sliders were designed to move aside in two different directions after injection. This creates parting lines, which was not an issue for this project, as the line would be positioned up against the base of the fittings – avoiding any cosmetic problems. Retractable pins were also used inside each core, which support the thin walls of the inlet and outlet fittings when the sliders were withdrawn. These were removed separately via spring action. The reservoir required that three small holes be molded into the cup around the circumference – intended for the later mounting of a locking cap. This further complicated the mold design. Our engineers determined that this was an ideal place to use the previously mentioned manual inserts since they could easily be moved in and out by hand. However, the process required a certain amount of time for the operator to remove the finished part from the tool and then remove manual inserts. This needed to be done quickly and efficiently by the operator, who then proceeded with the next injection cycle. If the delay was too long, the plastic inside the barrel of the machine would begin to degrade, damaging the subsequent part. Although the process is a bit tedious, it greatly simplified the tool making and kept costs down. Cooling channels were essential for maintaining a uniform wall temperature during injection to prevent warping. With this tool, the channels were conventionally machined, which means they followed straight, line-of-sight paths and were not ideal for following the curved contours needed for the reservoir. So, we created multiple cooling channels in critical areas, which is acceptable for a small prototype run. With the combination of these manufacturing techniques, we were able to create a component that met all the customer specifications. What were the benefits of working closely with the customer? Marco Beverage Systems’ input was invaluable for determining what finished result they were looking for. The continuous communication allowed us to make certain alterations to the design to allow for production concerns including the location of parting lines and draft angles. With the close cooperation between Marco Beverage Systems’ developers and our manufacturing engineers, we were able to overcome significant design challenges to ultimately create a beautiful and highly-functional component of the coffee system. Can you discuss other ways you are using advanced methods to develop new products and processes? The capabilities of manufacturing have certainly evolved in the last decade. At Star Rapid, the AddSub® service is unique as it allows us to combine direct metal laser melting (DMLM) 3D metal printing with 5-axis CNC machining on one production platform. The combination of these two advanced manufacturing techniques opens up new possibilities for creating next-generation parts that could not be made by either process alone. In the case of the Marco Beverage Systems coffee reservoir, improvements to the plastic injection molding will be made by integrating conformal cooling channels into the manual inserts. These channels will allow for optimal heating and cooling of the mold and faster cycle times, thereby greatly reducing defects caused by thermal stresses. We’ve only begun to explore the many applications for this revolutionary approach to advanced manufacturing. Our OMOM® rapid tooling service leverages the advantages of both manual and CNC machining in unique ways. For example, a manual machine can perform some processes much faster than its computerized counterpart because the manual machine does not need to be programmed. The tool maker then has complete freedom to determine the fastest and most efficient way to create the finished tool without being tied to any given formula. After all, each product is unique and there may be many ways to optimize how it’s built. Gordon Styles is the founder and president of Star Rapid, a provider of rapid prototyping, rapid tooling and low-volume production services. Utilizing his background in engineering, Gordon founded Star Rapid in 2005 and under his leadership the company has expanded to more than 200 employees. With an international team of engineers and technicians, Star Rapid combines advanced technologies – such as 3D printing and multi-axis CNC machining – with traditional manufacturing techniques and high quality standards. Prior to Star Rapid, Gordon owned and managed the United Kingdom’s largest rapid prototyping and rapid tooling company, STYLES RPD, which was sold to ARRK Europe in 2000.